They didn’t teach about the war on demonstration day. The guys in radio shack hadn’t mentioned it. The computer math teacher had no clue it was raging. It was a quiet guerrilla war. An insidious war. I’d learned how the war started from a magazine. Way back in the dark ages of computers, a shadowy figure walked off with a paper tape during a computer demonstration. 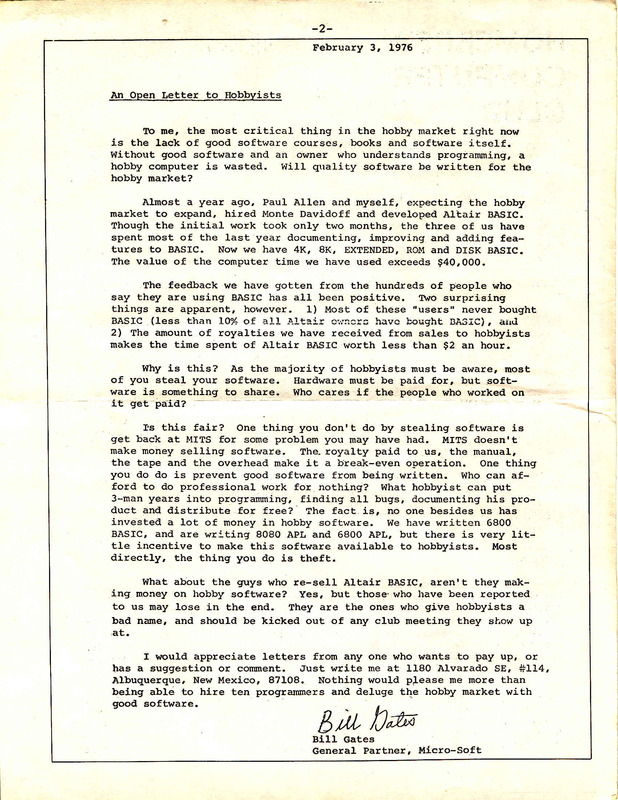 The tape contained Altair BASIC. The tape made its way to the now fabled Homebrew Computer Club where a guy with access to a tape punch volunteered to make copies. Members then passed those tapes around and made more copies. It wasn’t malicious. Club members were engineers and programmers. Most had soldered together their own computers. Some, like Woz, designed their own. Others used kits like the Altair. The group passed around every schematic they drew and computer program they wrote. It was the only way to learn. But this time was different. The Altair programmer flew into an Olympian rage at the Promethean act. Lacking an eagle, he send an open letter to the club calling them all thieves who steal software. He indignantly demanded they send their own livers. Few did. The stories seemed like ancient history to me. I had never seen an Altair computer. No one I knew had even heard of one. They had gone the way of CPU time. I had been using Mike’s Apple for a year. We started with the demo disks that came with the computer and a few games. We experimented writing trivial BASIC programs. When we couldn’t figure out how to do something we listed out one of the demo programs to see how it managed. We played games and when we got stuck we looked for clues in the BASIC code. That was the only way to learn. There just wasn’t anyone else to ask. A HUGE GREEN FIERCE DRAGON BARS THE WAY! I tried every object and treasure I had to try and vanquish the dragon but with no success. I finally decide to fall back on the solution of last resort. Read the code! But try as I might the program wouldn’t list out. I scanned the monitor through memory looking for hints in the text strings but there were none to read. Everything seemed to be deliberately encrypted so that I couldn’t read it. It was my first collateral damage experience from the war. If I could read the code, I might steal the code! “It’s only business,” everyone said. I was offended at the character aspersion, but it was more than that. Nobody is born knowing how to program. Learning by yourself takes extreme motivation, intense focus and plenty of good examples. Good games provided my focus and motivation to learn but “proprietary” code stoled my examples. Mike and I frequented the local computer stores, often pooling our money for new software. In 1979 disks and xeroxed instructions had hung from peg racks in ziploc bags. The tradition was to take baggies from the peg racks, open them up, and try the disks right there in the store. Games cost $30-$40 and there were always more interesting looking ones than my $3.25 minimum wage could could afford. Booting was the only way to separate the gems from the duds. 1980 was my pivotal year in the war. I didn’t intend to change sides. I was a Boy Scout not a pirate or rebel. Programs were morphing into “products”. Full color shrink-wrapped boxes replaced the ziploc bags. I couldn’t open them anymore. Opening damaged the merchandise. My dad bought an Apple that year. With it he bought an accounting package, a word processing program, a database, and a new spreadsheet called VisiCalc. All very expensive, most bought sight unseen. To celebrate the new computer, I bought myself a cool looking game. Disappointingly, only the box looked cool. The game inside sucked. When I tried to return it, the salesman said their policy was to not take back opened games. With a polite smile he suggested that I might have copied the game and was trying to get a refund. Accused again! Arg! I was crushed and dejected. It took all the money I had to buy a game not worth playing for five minutes. I spent my afternoons learning the business programs and teaching the novices in the office. Dad bought three word processors before we found a usable one. The second time I bought a crappy shrink wrapped game I wasn’t dejected. I was pissed. The shrink-wrapped system was deliberately stealing hard earned money. Mike and I shared disks at first. It wasn’t much of a bother. But in a moment of clumsiness his brother spilled a Coke on the stack of game disks. Most survived but a game we were currently playing became a sticky mess and would no longer turn. In desperation Mike cut open the outside plastic and carefully unstuck the magnetic disk inside. He washed the now very floppy bit of plastic under the sink and hoped it wouldn’t effect its magnet fields. I sacrificed a blank disk by carefully opening its shell to make a new home for the cleaned floppy. It worked! We were elated! There was no doubt left. We needed backup copies. I bought a box of blank disks and we set out to make copies of the games we didn’t want to lose. Most of the early games copied easily. Going through the disks, however, made us realize that some of the two year old floppies were already worn out. They simply wouldn’t boot anymore. None of the newer games, including the rehabilitated disk were copyable. The publishers called them “protected” disks. We saw them as unprotected from wear or another “Pepsi Syndrome.” Every time a protected disk failed I felt the publishers stealing from me again. In 1980 a program called Locksmith was released. It copied copy protected disks. We bought one of the first copies and finished our backups. I was a pirate following the footsteps of the tape punch Prometheus. It was the only way to learn. Associating the start of the war with the protected copy of Microsoft Adventure startled me. I had met the enemy. The name meant nothing at the time. But only a weasel would clearly defined all my issues, then go on to unilaterally manufacture all my problems. He and his allies had erased Woz’s commands, invalidated my nascent skills, hid the best examples, and charged exorbitant prices for crapware. It had become a war of those who knew, against those, like me, who wanted to know. The newcomer, hobbyist and geek rabble outside the ivory guild peering enviously at the fire burning in the soul of the machine. Posted by How I joined the Dark Side » Houston 2600 — Computer security, hacking, coding and mayhem on June 19th, 2011. Posted by Bob’s Way -The War | gfisk.com on June 19th, 2011. Posted by Abortifacient on June 20th, 2011. Posted by Bob Way on June 21st, 2011.